This article is about the city in Poland. For other uses, see Gdańsk (disambiguation). "Danzig" redirects here. For other uses, see Danzig (disambiguation). The city is located on the southern edge of Gdańsk Bay (of the Baltic Sea), in a conurbation with the city of Gdynia, spa town of Sopot, and suburban communities, which together form a metropolitan area called the Tricity (Trójmiasto), with a population approaching 1.4 million. Gdańsk is the capital of Gdańsk Pomerania and the largest city of Kashubia. With its origins as a Polish stronghold erected in the 980s by Mieszko I of Poland, the city's history is complex, with periods of Polish rule, periods of Prussian or German rule, and periods of autonomy or self-rule as a " free city". In the early-modern age Gdańsk was a royal city of Poland. It was considered the wealthiest and the largest city of Poland, prior to the 18th century rapid growth of Warsaw. 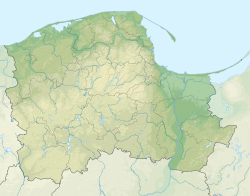 Between the world wars, the Free City of Danzig, having a majority of German population, was in a customs union with Poland and was situated between German East Prussia and the so-called Polish Corridor. 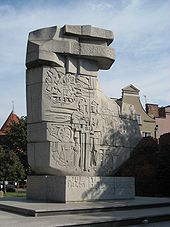 In the interwar period, owing to its multi-ethnic make-up and history, Gdańsk lay in a disputed region between Poland and the Weimar Republic, which later became Nazi Germany. The city's ambiguous political status was exploited, furthering tension between the two countries, which would ultimately culminate in the Invasion of Poland and the first clash of the Second World War just outside the city limits. In the 1980s it would become the birthplace of the Solidarity movement, which played a major role in bringing an end to Communist rule in Poland and helped precipitate the collapse of the Eastern Bloc, the fall of the Berlin Wall and the dissolution of the Soviet Union. The city's name is thought to originate from the Gdania River,  the original name of the Motława branch on which the city is situated. The name of a settlement was recorded after St. Adalbert's death in AD 997 as urbs Gyddanyzc  and later was written as Kdanzk in 1148, Gdanzc in 1188, Danceke  in 1228, Gdansk in 1236,  Danzc in 1263, Danczk in 1311,  Danczik in 1399,   Danczig in 1414, Gdąnsk in 1656. In Polish the modern name of the city is pronounced [ɡdaɲsk] ( listen). In English (where the diacritic over the "n" is frequently omitted) the usual pronunciation is /ɡəˈdænsk/ or /ɡəˈdɑːnsk/. The German name, "Danzig", is pronounced as [ˈdantsɪç] ( listen). The city's Latin name may be given as either Gedania, Gedanum or Dantiscum; the variety of Latin names reflects the mixed influence of the city's Polish, German and Kashubian heritage. Other former spellings of the name include Dantzig, Dantsic and Dantzic. 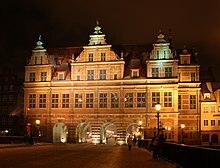 On special occasions the city is also referred to as "The Royal Polish City of Gdańsk" (Polish Królewskie Polskie Miasto Gdańsk, Latin Regia Civitas Polonica Gedanensis, Kashubian Królewsczi Polsczi Gard Gduńsk). In the Kashubian language the city is called Gduńsk. Kashubians also use the name "Our Capital City Gduńsk" (Nasz Stoleczny Gard Gduńsk) or "The Kashubian Capital City Gduńsk" (Stoleczny Kaszëbsczi Gard Gduńsk). 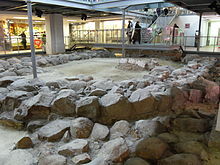 Archaeological evidence for the origins of the town was retrieved mostly after World War II had laid 90 percent of the city center in ruins, enabling excavations. The oldest seventeen settlement levels were dated to between 980 and 1308. It is generally thought that Mieszko I of Poland erected a stronghold on the site in the 980s, thereby connecting the Polish state ruled by the Piast dynasty with the trade routes of the Baltic Sea. Traces of buildings and housing from 10th century have been found in archaeological excavations of the city . In 1300, the town had an estimated population of 2,000. While overall the town was not a very important trade centre at that time, it had some relevance in the trade with Eastern Europe. Low on funds, the Samborides lent the settlement to Brandenburg, although they planned to take the city back and give it to Poland. Poland threatened to intervene, and Brandenburg left the town. Subsequently, the city was taken by Danish princes in 1301. The Teutonic Knights were hired by the Polish nobles to drive out the Danes. Monument to defenders of Polish Gdańsk also commemorates the victims of the 1308 massacre carried out by the Teutonic Knights. Gaining free and privileged access to Polish markets, the seaport prospered while simultaneously trading with the other Hanseatic cities. After the Second Peace of Thorn (1466) with the Teutonic Monastic State of Prussia the warfare between the latter and the Polish crown ended permanently. After the Union of Lublin between Poland and Lithuania in 1569 the city continued to enjoy a large degree of internal autonomy (cf. Danzig Law). Being the largest and one of the most influential cities of Poland, it enjoyed voting rights during the royal election period in Poland. In 1569 a Mennonite Church was founded here. Around 1640, Johannes Hevelius established his astronomical observatory in the Old Town. Polish King John III Sobieski regularly visited Hevelius numerous times. The city suffered a last great plague and a slow economic decline due to the wars of the 18th century. As a stronghold of Stanisław Leszczyński's supporters during the War of the Polish Succession, it was taken by the Russians after the Siege of Danzig in 1734. Gdańsk Town Hall, with its 83-meter spire, is one of the city's main landmarks. The Danzig Research Society (in German Naturforschende Gesellschaft in Danzig) founded in 1743 was one of the first of its kind. 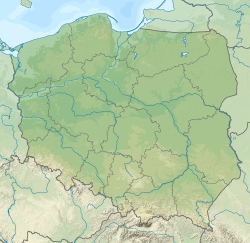 Danzig was annexed by the Kingdom of Prussia in 1793,  in the Second Partition of Poland. An attempt of student uprising against Prussia led by Gottfried Benjamin Bartholdi was crushed quickly by the authorities in 1797. During the era of Napoleon the city became a free city in the period extending from 1807 to 1814. In 1815, after France's defeat in the Napoleonic Wars, it again became part of Prussia  and became the capital of Regierungsbezirk Danzig within the province of West Prussia. The city's longest serving president was Robert von Blumenthal, who held office from 1841, through the revolutions of 1848, until 1863. With the unification of Germany under Prussian hegemony, the city became part of Imperial Germany (the German Empire) in 1871, and remained so until 1919, after Germany's defeat in World War I.
Colorized photo, c. 1900, showing prewar roof of the Krantor crane (Brama Żuraw). When Poland regained its independence after World War I with access to the sea as promised by the Allies on the basis of Woodrow Wilson's " Fourteen Points" (point 13 called for "an independent Polish state", "which should be assured a free and secure access to the sea"), the Poles hoped the city's harbour would also become part of Poland. However, in the end - since Germans formed a majority in the city, with Poles being a minority (in the 1923 census 7,896 people out of 335,921 gave Polish, Kashubian or Masurian as their native language)  - the city was not placed under Polish sovereignty. Instead, in accordance with the terms of the Versailles Treaty, it became the Free City of Danzig (German: Freie Stadt Danzig), an independent quasi-state under the auspices of the League of Nations with its external affairs largely under Polish control, without however any public vote to legitimize Germany's loss of the city. Poland's rights also included free use of the harbour, a Polish post office, a Polish garrison in Westerplatte district, and customs union with Poland. This led to a considerable tension between the city and the Republic of Poland. The Free City had its own constitution, national anthem, parliament ( Volkstag), and government (Senat). It issued its own stamps as well as its currency, the Danzig gulden. A 100 Danzig gulden banknote issued by the Bank of Danzig in 1931. In the early 1930s the local Nazi Party capitalised on pro-German sentiments and in 1933 garnered 50% of vote in the parliament. Thereafter, the Nazis under Gauleiter Albert Forster achieved dominance in the city government, which was still nominally overseen by the League of Nations' High Commissioner. The German government officially demanded the return of Danzig to Germany along with an extraterritorial (meaning under German jurisdiction) highway through the area of the Polish Corridor for land-based access from the rest of Germany. Hitler used the issue of the status of the city as a pretext for attacking Poland and on May 1939, during a high level meeting of German military officials explained to them: "It is not Danzig that is at stake. For us it is a matter of expanding our Lebensraum in the east", adding that there will be no repeat of the Czech situation, and Germany will attack Poland at first opportunity, after isolating the country from its Western Allies. After the German proposals to solve the three main issues peacefully were refused and the sixteen point proposal had been undermined by the British Government (Navy Minister Cooper), German-Polish relations rapidly deteriorated. Germany attacked Poland on 1 September after having signed a non-aggression pact with the Soviet Union (this includes the Secret Part with the upcoming treatment of the Baltic States) in late August and after postponing the attack three times due to needed time for diplomatic, peaceful solutions. Captured Polish defenders of the Polish Post Office in Danzig shortly before their trial and execution by the Wehrmacht. The city was officially annexed by Nazi Germany and incorporated into the Reichsgau Danzig-West Prussia. About 50 percent of members of the Jewish Community of Danzig had left the city within a year after a Pogrom in October 1937,  after the Kristallnacht riots in November 1938 the community decided to organize its emigration  and in March 1939 a first transport to Palestine started. By September 1939 barely 1,700 mostly elderly Jews remained. In early 1941, just 600 Jews were still living in Danzig, most of whom were later murdered in the Holocaust. Out of the 2,938 Jewish community in the city 1,227 were able to escape from the Nazis before the outbreak of war. [ dubious – discuss] Nazi secret police had been observing Polish minority communities in the city since 1936, compiling information, which in 1939 served to prepare lists of Poles to be captured in Operation Tannenberg. On the first day of the war, approximately 1,500 ethnic Poles were arrested, some because of their participation in social and economic life, others because they were activists and members of various Polish organisations. On 2 September 1939, 150 of them were deported to the Sicherheitsdienst camp Stutthof some 30 miles (48 km) from Danzig, and murdered. Many Poles living in Danzig were deported to Stutthof or executed in the Piaśnica forest. In December 1970, Gdańsk was the scene of anti-regime demonstrations, which led to the downfall of Poland's communist leader Władysław Gomułka. During the demonstrations in Gdańsk and Gdynia, military as well as the police opened fire on the demonstrators causing several dozen deaths. Ten years later, in August, 1980, Gdańsk Shipyard was the birthplace of the Solidarity trade union movement. Gdańsk native Donald Tusk became Prime Minister of Poland in 2007, and President of the European Council in 2014. Today Gdańsk is a major shipping port and tourist destination. Gdańsk has a climate with both oceanic and continental influences. According to some categorizations, it has an oceanic climate (Cfb) , while others classify it as belonging to the continental climate zone (Dfb) . It actually depends on whether the mean reference temperature for the coldest winter month is set at −3 °C (27 °F) or 0 °C (32 °F). Gdańsk's dry winters and the precipitation maximum in summer are indicators of continentality. However seasonal extremes are less pronounced than those in inland Poland. The city has moderately cold and cloudy winters with mean temperature in January and February near or below 0 °C (32 °F) and mild summers with frequent showers and thunderstorms. Average temperatures range from −1.0 to 17.2 °C (30 to 63 °F) and average monthly rainfall varies 17.9 to 66.7 millimetres (1 to 3 in) per month with a rather low annual total of 507.3 millimetres (20 in). In general, it is damp, variable, and mild. The seasons are clearly differentiated. Spring starts in March and is initially cold and windy, later becoming pleasantly warm and often very sunny. Summer, which begins in June, is predominantly warm but hot at times with temperature reaching as high as 30 to 35 °C (86 to 95 °F) at least once per year with plenty of sunshine interspersed with heavy rain. Gdańsk averages 1,700 hours of sunshine per year. July and August are the warmest months. Autumn comes in September and is at first warm and usually sunny, turning cold, damp, and foggy in November. Winter lasts from December to March and includes periods of snow. January and February are the coldest months with the temperature sometimes dropping as low as −15 °C (5 °F). The city has some buildings surviving from the time of the Hanseatic League. Most tourist attractions are located along or near Ulica Długa (Long Street) and Długi Targ (Long Market), a pedestrian thoroughfare surrounded by buildings reconstructed in historical (primarily during the 17th century) style and flanked at both ends by elaborate city gates. This part of the city is sometimes referred to as the Royal Route, since it was once the former path of processions for visiting Kings of Poland. Gdańsk has a number of historical churches, including St. Catherine's Church and St. Mary's Church (Bazylika Mariacka). This latter is a municipal church built during the 15th century, and is the largest brick church in the world. The city's 17th-century fortifications represent one of Poland's official national Historic Monuments ( Pomnik historii), as designated on 16 September 1994 and tracked by the National Heritage Board of Poland. museum ship SS Soldek is anchored on the Motława River and was the first ship built in post-war Poland. European Solidarity Centre. Museum and library dedicated to the history of the Solidarity movement. The Szybka Kolej Miejska, (SKM) the Fast Urban Railway, functions as a Metro system for the Tricity area including Gdańsk, Sopot and Gdynia, operating frequent trains to 27 stations covering the Tricity. The service is operated by electric multiple unit trains at a frequency of 6 minutes to 30 minutes between trains (depending on the time of day) on the central section between Gdańsk and Gdynia, and less frequently on outlying sections. The SKM system has been extended northwest of the Tricity, to Wejherowo, Lębork and Słupsk, 110 kilometres (68 miles) west of Gdynia, and to the south it has been extended to Tczew, 31 kilometres (19 miles) south of Gdańsk. Long distance trains are operated by PKP Intercity which provides connections with all major Polish cities, including Warsaw, Kraków, Łódź, Poznań, Katowice and Szczecin, and with the neighbouring Kashubian Lakes region. A new railway, Pomorska Kolej Metropolitalna (PKM, the 'Pomeranian Metropolitan Railway'), commenced service on 1 September 2015, connecting Gdańsk Lech Wałęsa Airport with Wrzeszcz and downtown Gdańsk. 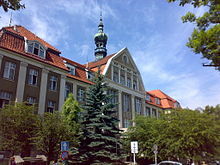 It connects to the Szybka Kolej Miejska (Tricity) (SKM) which provides further connections to the entire area served by SKM. City buses and trams are operated by ZTM Gdańsk (Zarząd Transportu Miejskiego w Gdańsku). Obwodnica Trojmiejska – part of expressway S6 that bypasses the cities of Gdańsk, Sopot and Gdynia. The A1 motorway connects the port and city of Gdańsk with the southern border of the country. As of 2014 [update], some fragments of the A1 motorway are still incomplete. Gdańsk is the starting point of the EuroVelo 9 cycling route which continues southward through Poland, then into the Czech Republic, Austria and Slovenia before ending at the Adriatic Sea in Pula, Croatia. The city's professional football club is Lechia Gdańsk. Founded in 1945, they play in the Ekstraklasa, Poland's top division. Their home stadium, Stadion Energa Gdańsk, was one of the four Polish stadiums to host the UEFA Euro 2012 competition. Other notable clubs include rugby club Lechia Gdańsk (12 times Polish Champion) and motorcycle speedway club Wybrzeże Gdańsk. 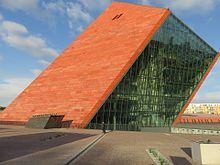 Contemporary Gdańsk is the capital of the province called Pomeranian Voivodeship and is one of the major centers of economic and administrative life in Poland. Many important agencies of the state and local government levels have their main offices here: the Provincial Administration Office, the Provincial Government, the Ministerial Agency of the State Treasury, the Agency for Consumer and Competition Protection, the National Insurance regional office, the Court of Appeals, and the High Administrative Court. Gdańsk Voivodeship was extended in 1999 to include most of former Słupsk Voivodeship, the western part of Elbląg Voivodeship and Chojnice County from Bydgoszcz Voivodeship to form the new Pomeranian Voivodeship. The area of the region was thus extended from 7,394 to 18,293 square kilometres (2,855 to 7,063 sq mi) and the population rose from 1,333,800 (1980) to 2,198,000 (2000). By 1998, Tricity constituted an absolute majority of the population; almost half of the inhabitants of the new region live in the centre. Legislative power in Gdańsk is vested in a unicameral Gdańsk City Council (Rada Miasta), which comprises 34 members. Council members are elected directly every four years. Like most legislative bodies, the City Council divides itself into committees which have the oversight of various functions of the city government. Gdańsk is divided into 34 administrative divisions: 6 dzielnicas and 28 osiedles. Gdańsk dzielnicas include: Chełm, Piecki-Migowo, Przymorze Wielkie, Śródmieście, Wrzeszcz Dolny, Wrzeszcz Górny. Osiedles: Aniołki, Brętowo, Brzeźno, Jasień, Kokoszki, Krakowiec-Górki Zachodnie, Letnica, Matarnia, Młyniska, Nowy Port, Oliwa, Olszynka, Orunia-Św. Wojciech-Lipce, Osowa, Przeróbka, Przymorze Małe, Rudniki, Siedlce, Sobieszewo Island, Stogi, Strzyża, Suchanino, Ujeścisko-Łostowice, VII Dwór, Wzgórze Mickiewicza, Zaspa-Młyniec, Zaspa-Rozstaje, Żabianka-Wejhera-Jelitkowo-Tysiąclecia. There are 15 higher schools including 3 universities. In 2001 there were 60,436 students, including 10,439 graduates. ^ "Local Data Bank". Statistics Poland. Retrieved 10 November 2018. Data for territorial unit 2261000. ^ "the definition of gdansk". Dictionary.com. ^ "Poland – largest cities (per geographical entity)". World Gazetteer. Archived from the original on December 26, 2008. Retrieved 2009-05-05. ^ "Gdansk Guide". archive.is. 3 July 2012. Archived from the original on 3 July 2012. Retrieved 16 April 2019. ^ a b Tighe, Carl (1990). Gdańsk: national identity in the Polish-German borderlands. Pluto Press. ISBN 9780745303468. Retrieved 2016-02-11. ^ Gumowski, Marian (1966). Handbuch der polnischen Siegelkunde (in German). Retrieved 2016-02-11. ^ "The Crane: past and present - Crane - National Maritime Museum in Gdańsk". en.nmm.pl. Retrieved 16 April 2019. ^ a b Loew, Peter Oliver: Danzig. Biographie einer Stadt, Munich 2011, p. 24. ^ a b Wazny, Tomasz; Paner, Henryk; Golebiewski, Andrzej; Koscinski, Bogdan: Early medieval Gdansk/Danzig revisited (EuroDendro 2004), Rendsburg 2004, pdf-abstract Archived September 9, 2013, at the Wayback Machine. ^ Loew (2011), p. 24; Wazny et al. (2004), abstract Archived September 9, 2013, at the Wayback Machine. ^ Hess, Corina (2007). Danziger Wohnkultur in der frühen Neuzeit. Berlin-Hamburg-Münster: LIT Verlag. p. 39. ISBN 978-3-8258-8711-7. ^ admin2. "1000 LAT GDAŃSKA W ŚWIETLE WYKOPALISK". Retrieved 18 March 2017. ^ a b Hess, Corina (2007). Danziger Wohnkultur in der frühen Neuzeit. Berlin-Hamburg-Münster: LIT Verlag. p. 40. ISBN 978-3-8258-8711-7. ^ a b name="harlander"> Harlander, Christa (2004). Stadtanlage und Befestigung von Danzig (zur Zeit des Deutschen Ordens). GRIN Verlag. p. 2. ISBN 978-3-638-75010-3. ^ Zbierski, Andrzej (1978). Struktura zawodowa, spoleczna i etnicza ludnosci. In Historia Gdanska, Vol. 1. Wydawnictwo Morskie. pp. 228–9. ISBN 978-83-86557-00-4. ^ Turnock, David (1988). The Making of Eastern Europe: From the Earliest Times to 1815. Routledge. p. 180. ISBN 978-0-415-01267-6. ^ name="lingenberg"> Lingenberg, Heinz (1982). Die Anfänge des Klosters Oliva und die Entstehung der deutschen Stadt Danzig: die frühe Geschichte der beiden Gemeinwesen bis 1308/10. Klett-Cotta. p. 292. ISBN 978-3-129-14900-3. ^ a b Hess, Corina (2007). Danziger Wohnkultur in der frühen Neuzeit. Berlin-Hamburg-Münster: LIT Verlag. pp. 40–41. ISBN 978-3-8258-8711-7. ^ a b c d Hess, Corina (2007). Danziger Wohnkultur in der frühen Neuzeit. Berlin-Hamburg-Münster: LIT Verlag. p. 41. ISBN 978-3-8258-8711-7. ^ Hess, Corina (2007). Danziger Wohnkultur in der frühen Neuzeit. Berlin-Hamburg-Münster: LIT Verlag. pp. 41–42. ISBN 978-3-8258-8711-7. ^ Frankot, Edda (2012). 'Of Laws of Ships and Shipmen': Medieval Maritime Law and its Practice in Urban Northern Europe. Edinburgh: Edinburgh University Press. p. 100. ISBN 978-0-7486-4624-1. ^ a b Hess, Corina (2007). Danziger Wohnkultur in der frühen Neuzeit. Berlin-Hamburg-Münster: LIT Verlag. p. 42. ISBN 978-3-8258-8711-7. ^ Loew, Peter O. (2011). Danzig: Biographie einer Stadt. München: C.H.Beck. p. 43. ISBN 978-3-406-60587-1. ^ Sobecki, Sebastian (2016). Danzig. Europe: A Literary History, 1348–1418, Ed. David Wallace. Oxford University Press. pp. 635–41. ISBN 9780198735359. ^ "II Pokój Toruński i przyłączenie Gdańska do Rzeczpospolitej". mgdansk.pl. ^ Cahoon, Ben. "Poland". worldstatesmen.org. ^ a b c Hess, Corina (2007). Danziger Wohnkultur in der frühen Neuzeit. Berlin-Hamburg-Münster: LIT Verlag. p. 45. ISBN 978-3-8258-8711-7. ^ Hess, Corina (2007). Danziger Wohnkultur in der frühen Neuzeit. Berlin-Hamburg-Münster: LIT Verlag. p. 45. ISBN 978-3-8258-8711-7. : "Geben wir und verlehen unnsir Stadt Danczk das sie zcu ewigen geczeiten nymands for eynem herrn halden noc gehorsam zcu weszen seyn sullen in weltlichen sachen." ^ "Zielona Brama w Gdańsku". wilanowmiasta.gazeta.pl (in Polish). 2007-02-18. Archived from the original on 2007-12-29. Retrieved 2008-12-29. ^ Zamoyski, Adam (2015). Poland. A History. William Collins. p. 26, 92. ISBN 978-0007556212. ^ Bömelburg, Hans-Jürgen, Zwischen polnischer Ständegesellschaft und preußischem Obrigkeitsstaat: vom Königlichen Preußen zu Westpreußen (1756–1806), München: Oldenbourg, 1995, (Schriften des Bundesinstituts für Ostdeutsche Kultur und Geschichte (Oldenburg); 5), zugl. : Mainz, Johannes Gutenberg-Univ., Diss., 1993, 549 pp. ^ a b Planet, Lonely. "History of Gdańsk – Lonely Planet Travel Information". lonelyplanet.com. ^ Ergebnisse der Volks- und Berufszählung vom 1. November 1923 in der Freien Stadt Danzig (in German). Verlag des Statistischen Landesamtes der Freien Stadt Danzig. 1926. . Polish estimates of the Polish minority during the interwar era, however, range from 37,000 to 100,000 (9%–34%). Studia historica Slavo-Germanica, Tomy 18–20page 220 Uniwersytet Adama Mickiewicza w Poznaniu. Instytut Historii Wydawnictwo Naukowe imienia. Adama Mickiewicza, 1994. ^ a b "Gdansk". Retrieved 18 March 2017. ^ Bauer, Yehuda (1981). American Jewry and the Holocaust. Wayne State University Press. p. 145. ISBN 978-0-8143-1672-6. Retrieved 2016-02-11. ^ "Die "Lösung der Judenfrage" in der Freien Stadt Danzig". www.shoa.de (in German). 2018-11-30. Archived from the original on 2011-06-29. ^ Biskupski, Mieczysław B. The History of Poland. Westport, CT: Greenwood Press, p. 97. ^ Tighe, Carl. Gdańsk: National Identity in the Polish-German Borderlands. London: Palgrave Macmillan, p. 199. ^ Loew, Peter Oliver (2011). Danzig – Biographie einer Stadt (in German). C.H. Beck. p. 232. ISBN 978-3-406-60587-1. Retrieved 2016-02-11. ^ Lech Krzyżanowski; Michał Wożniak; Marek Źak; Wacław Górski (1995). Beautiful historic Gdańsk. Excalibur. p. 769. ^ Kozinska, Bogdana; Bingen, Dieter (2005). Die Schleifung – Zerstörung und Wiederaufbau historischer Bauten in Deutschland und Polen (in German). Deutsches Polen-Institut. p. 67. ISBN 978-3-447-05096-8. Retrieved 2016-02-11. ^ Loew, Peter Oliver (2011). Danzig – Biographie einer Stadt (in German). C.H. Beck. p. 146. ISBN 978-3-406-60587-1. ^ Kalinowski, Konstanty; Bingen, Dieter (2005). Die Schleifung – Zerstörung und Wiederaufbau historischer Bauten in Deutschland und Polen (in German). Deutsches Polen-Institut. p. 89. ISBN 978-3-447-05096-8. Retrieved 2016-02-11. ^ Friedrich, Jacek (2010). Neue Stadt in altem Glanz – Der Wiederaufbau Danzigs 1945–1960 (in German). Böhlau. pp. 30, 40. ISBN 978-3-412-20312-2. ^ Czepczynski, Mariusz (2008). Cultural landscapes of post-socialist cities: representation of powers and needs. Ashgate publ. p. 82. ISBN 978-0-7546-7022-3. ^ Friedrich, Jacek (2010). Neue Stadt in altem Glanz – Der Wiederaufbau Danzigs 1945–1960 (in German). Böhlau. pp. 34, 102. ISBN 978-3-412-20312-2. ^ "Italy's Mogherini and Poland's Tusk get top EU jobs". BBC. 30 August 2014. Retrieved 8 August 2015. ^ "Gdansk mayor Pawel Adamowicz dies after being stabbed in heart on stage". CNN. 14 January 2019. Retrieved 14 January 2019. ^ "Mayor of Polish city dies after stabbing at charity event". www.msn.com. Retrieved 16 April 2019. ^ " Gdansk". Weatherbase.com. Retrieved 14 February 2018. ^ "World Weather Information Service – Gdańsk". WMO. Retrieved 20 October 2015. ^ Russell Sturgis; Arthur Lincoln Frothingham (1915). A history of architecture. Baker & Taylor. p. 293. ^ Paul Wagret; Helga S. B. Harrison (1964). Poland. Nagel. p. 302. ^ ROBiDZ w Gdańsku. "Kaplica Królewska w Gdańsku". www.wrotapomorza.pl (in Polish). Archived from the original on February 10, 2015. Retrieved 2008-12-29. ^ Snow, Georgia (3 September 2014). "Elizabethan playhouse in Poland to host work by Shakespeare's Globe". The Stage. Retrieved 15 September 2014. ^ "Pendolino z Trójmiasta do Warszawy. Więcej pytań niż odpowiedzi". trojmiasto.pl. 2013-07-30. ^ "Państwowa Komisja Wyborcza: Wybory samorządowe". wybory2002.pkw.gov.pl. Retrieved 2015-10-09. ^ "Geografia wyborcza – Wybory samorządowe – Państwowa Komisja Wyborcza". wybory2006.pkw.gov.pl. Retrieved 2015-10-09. ^ "Wybory Samorządowe 2010 – Geografia wyborcza – Województwo pomorskie – – m. Gdańsk". wybory2010.pkw.gov.pl. Retrieved 2015-10-09. ^ "Państwowa Komisja Wyborcza | Gdańsk". wybory2014.pkw.gov.pl. Archived from the original on 2014-12-18. Retrieved 2015-10-09. ^ "Akademia Sztuk Pięknych w Gdańsku". asp.gda.pl. ^ "Institute of Fluid Flow Machinery of the Polish Academy of Sciences". imp.gda.pl/en. ^ "The Gdańsk Institute for Market Economics". Archived from the original on 2008-02-09. Retrieved 2009-07-25. ^ a b c d e f g h i j k l m n o p q r s "Partner Cities" (in Polish and English). City of Gdańsk. 27 May 2008. Retrieved 2015-01-04. ^ Frohmader, Andrea. "Bremen – Referat 32 Städtepartnerschaften / Internationale Beziehungen" [Bremen – Unit 32 Twinning / International Relations]. Das Rathaus Bremen Senatskanzlei [Bremen City Hall – Senate Chancellery] (in German). Archived from the original on 2011-07-18. Retrieved 2013-08-09. ^ "Villes jumelées avec la Ville de Nice" (in French). Ville de Nice. Archived from the original on October 29, 2012. Retrieved 2013-06-24. ^ "Saint Petersburg in figures – International and Interregional Ties". Saint Petersburg City Government. Archived from the original on 2009-02-24. Retrieved 2008-03-23. ^ "Le Havre – Les villes jumelées" [Le Havre – Twin towns]. City of Le Havre (in French). Archived from the original on 2013-07-29. Retrieved 2013-08-07. Kimmich, Christoph M (1968). The free city: Danzig and German foreign policy, 1919–1934. Yale University Press, New Haven, Connecticut. Retrieved 8 March 2010. Rudziński, Grzegorz (1 March 2001). Gdańsk. Bonechi. ISBN 978-88-476-0517-6. Retrieved 26 February 2010. Simson, Paul (October 2009). Geschichte Der Stadt Danzig. BiblioBazaar, LLC. ISBN 978-1-115-53256-3. Retrieved 26 February 2010. Wikimedia Commons has media related to Gdańsk. Wikisource has the text of the 1911 Encyclopædia Britannica article Danzig. 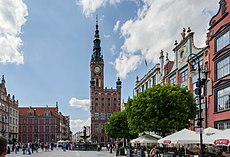 Wikivoyage has a travel guide for Gdańsk. Look up Gdańsk in Wiktionary, the free dictionary.